With rare exceptions, nothing truly worthwhile in life happens by accident. Sure, you may win the lottery but what are the odds? What if you could achieve everything you ever wanted without winning the lottery? What if it was as simple as deciding where you wanted to go and planning the route to get there? It is. Goal setting is the process of deciding where you want to go in life and then mapping out a series of steps to get you there. Success is something we create for ourselves. Luck has nothing to do with it. All successful people set goals. Some may have a structured routine, others a “vision.” Some may not even consciously set goals at all. But the process is the same. Successful people know what they want, determine the steps that will get them there, and then they implement them. By setting and achieving goals, you will use your time more productively, perform better and more efficiently than ever before. With every goal you achieve, your self-confidence will increase, motivating you to aim ever higher. If you have goals, you have purpose. If you have purpose, you have direction. If you have direction, you do not waste a whole heap of time (such as a lifetime) on activities and things that will not get you where or what you want. Think of it as setting out on a long journey to somewhere you have never been before. Would you even put the key in the ignition unless you had a destination in mind and a map to get you there? If you’re heading out for a lazy Sunday drive, maybe you would. But if your destination is somewhere specific, no way. You’d just end up spinning your wheels. Your life is the longest and most exciting adventure you will ever take. Make sure you have a map before you start out. You may decide to take some side trips along the way, but you’ll at least reach your destination eventually. You may even find some shortcuts. But if you leave without a map at all, you may just waste the entire journey driving around in circles. Remember the old adage, “Be careful what you wish for, you may just get it.” Be careful what you choose for your goals because you will probably get it. The methodical process of goal setting will make it inevitable. The first step to setting effective goals is to know what it is you want. The key word in the last sentence is “you.” It is what you want that is important, not what others want for you or for themselves through you. If you don’t want to achieve your goal, you certainly won’t. Conversely, if you have a burning desire to achieve your goal, you surely will. Begin defining your goals by writing a wish list. Don’t censor yourself. Visualize yourself living your ideal life. Think of categories such as career, education, family, personal life, physical, spiritual, financial, social, pleasure and attitude. What is your highest ideal for each of these categories? Write it down. Perhaps it is to be at the top of your profession, perhaps to be self-employed. Maybe it’s to earn a PhD by the time you’re 45 or to marry and have a family. It might be to attain your ideal weight and to be physically fit. It could be to have a small circle of very close friends or to earn enough money to retire at 50. What kind of a house do you want to live in? Where do you want to live? What type of car do you want to drive? What exciting destinations do you want to travel to? Paint a picture. Use sweeping strokes and bold color. There are no limits. You are the architect of your future. You are limited only by your imagination. Once you have a vision for your life, it is time to start crystallising your dreams and expressing them in terms of specific objectives. Before beginning the work of actually setting objectives, goals and supporting tasks, it is important to understand the criteria for setting effective goals. First, use the present tense. Express the goal as if it has already been achieved and not as something that will only occur in the future. It is important to think of your goals in the present tense, as this is what registers with your subconscious. If your subconscious believes it is not something that is to happen now, it will not work on it now. It will deal with it later, when the appropriate time comes. Of course, for a goal that is expressed in the future tense, the time never comes. Next, focus on outcome, not performance. Don’t worry about how you are going to achieve your goal, concentrate only on the outcome. Focus on your vision for the goal category. Example: I retire at 50 as I am independently wealthy, not I start my own business, quit my job, pay off all of my debts and invest successfully. Make your goals challenging. While your goals must be realistic, they must also be challenging if you are to gain any real benefit from them. After all, if you merely set as a goal something you would have achieved anyway (such as that automatic raise next month), what have you really achieved? Now that you have written down your wish list and understand the criteria for effective goals, it is time to begin translating your wish list into a goal plan. It will be obvious that by starting long term and working backwards, the idea is to break each intimidating objective down into manageable steps. The end result will be a daily “to do” list. Before going too far with this, however, take a moment to think through what you will need to achieve those longer term goals. Think about what skills you will need to acquire and how to get them: what information and knowledge, what help, assistance and collaboration, what resources. Then try and anticipate obstacles and plan a way around them. Prepare for all foreseen contingencies. Once you have a clear idea of what you will need, you can build these things into your goal plan. By this point you should have worked your way backwards to at least the one-year mark. Now work back to the six-month mark. What do you need to do within the next six months to achieve your one-year goals? one-month goals. What do you need to do within the next month to achieve your six-month goals? Finally, by continually working backwards in this way, you will eventually get to the point where you are writing out what you need to do today to achieve your longer-term goals. In this way, long-term goals are broken down into small, manageable tasks that are done on a day-to-day basis. The process is an incremental one of small steps today leading you ever closer to achieving your life’s desires. Imagine not having a daily task list. What would you be doing instead? Going to the same old boring job day in, day out, pottering about, starting something and not finishing it? Going around in circles, watching too much TV? With a daily task list, you can be sure that you’re investing your time and energies in activities that will bring you long-term benefit. These activities will bring structure and purpose to your day and eliminate time wasters. Soon you will find yourself becoming discriminating in what you give your time to. You will ask yourself, “How does this bring me closer to my goal of x?” You will learn there is a certain satisfaction and sense of accomplishment in crossing off a task as completed. You will feel secure in the knowledge you are taking care of business, and, of course, once you have taken care of business, you can take some guilt-free time for play. In this series of articles you’ve learned why setting goals is important, how to decide what it is you really want, how to set effective goals, and how to create a goal plan by starting long term and working backwards in time. 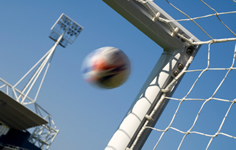 This final article in the series concentrates on how to achieve the goals you have set. Now, obviously, once you have a daily task list, you have in your hands the steps you need to take to reach your longer-term objectives. But along the road to your destination, you are going to encounter unexpected twists and turns. And probably a pothole or two for good measure. You may find you get bored doing the same things day after day. You are going to have setbacks and crises of confidence. These are all to be expected and are perfectly natural and normal. The trick, though, is not to let them derail you from your course. This is what separates the successes from the wanna-bes. There are five keys to staying on track: commitment, flexibility, discipline, determination and persistence. Designing a goal plan and sticking to it requires commitment. It requires commitment to yourself and to your values and ideals. Unless you are committed to improving your life, don’t even bother starting with goal setting. It won’t be worth the effort. Remind yourself constantly of your objectives. Put up photographs that represent your goals in prominent places. 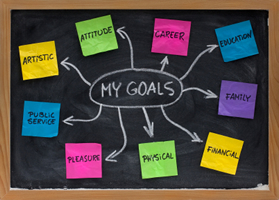 Write the reasons you want to achieve a particular objective next to the objective in your goal plan. Read them every morning and evening. If your reasons don’t compel you to keep striving, then perhaps they are not good enough reasons. Maybe the objective is not something you want badly enough. If so, change it. Don’t let your objectives lock you into a path you don’t want to go down. Be flexible. Setting and achieving goals is a lifetime process. Over the course of a lifetime you will go through many changes. What was important to you ten years ago may not be a priority anymore. If this happens to you, let it go. Set new objectives that are consistent with who you are today. daily performance of seemingly minor tasks can make over only a relatively short period of time. When you suffer setbacks, and you will, grit your teeth and keep going. This is what separates the winners from the wanna-bes. Anyone can give up when the going gets tough. Most do, in fact. It is those who keep going in the face of setbacks who are ultimately victorious. And finally, persistence, persistence, persistence! Never give up. Never ever let anyone else make you doubt whether you can achieve your goals. Your success is in your own hands. Reach out and take it! © 2007. Elena Fawkner is editor of Home-Based Business Online. Best business ideas and opportunities for your home-based or online business.